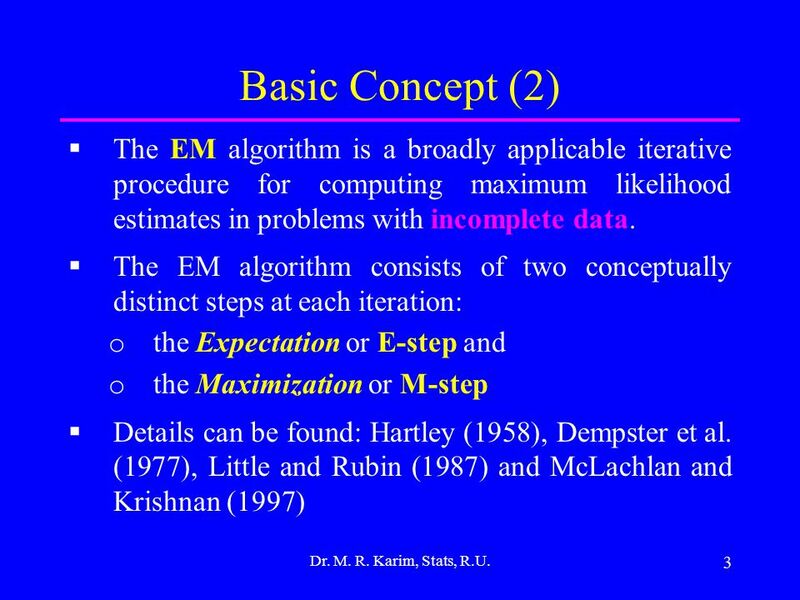 Expectation-Maximization (EM) Algorithm Md. Rezaul Karim Professor Department of Statistics University of Rajshahi Bangladesh September 21, 2012. 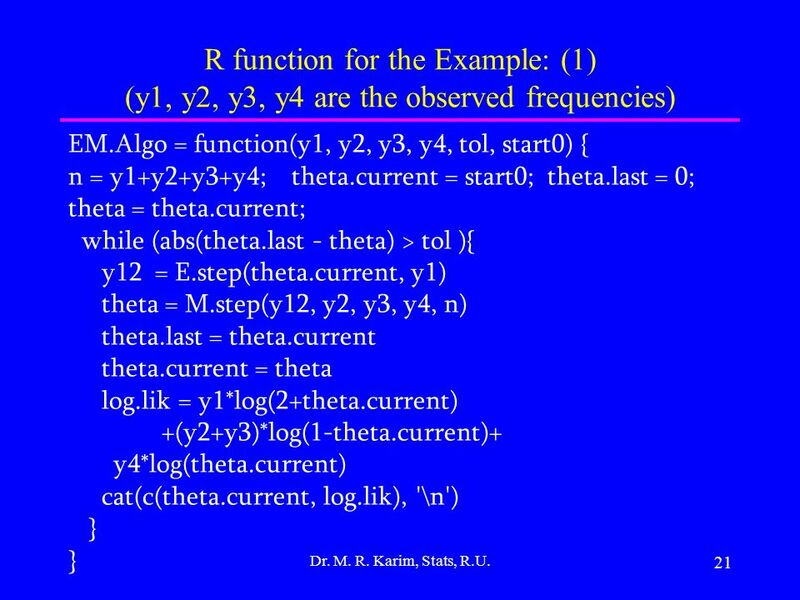 2 2 Basic Concept (1) Dr. M. R. Karim, Stats, R.U. 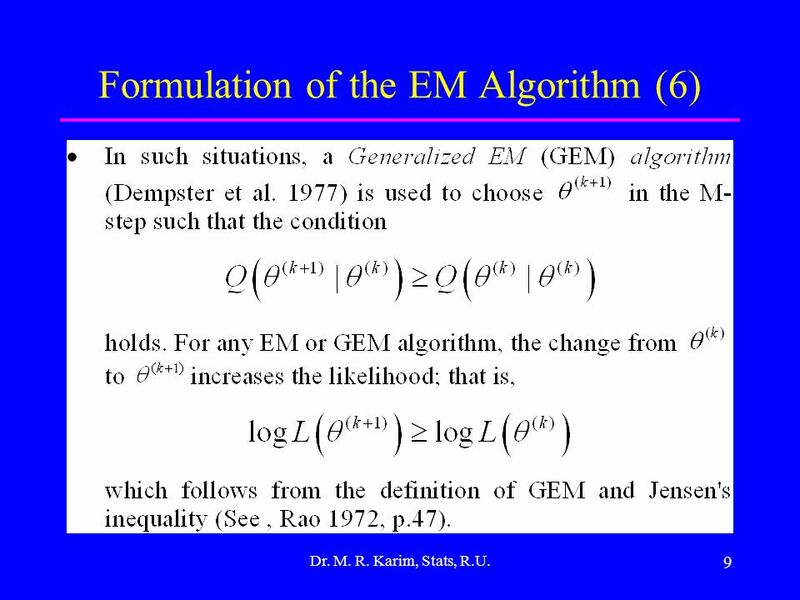  EM algorithm stands for “Expectation- Maximization” algorithm  A parameter estimation method: it falls into the general framework of maximum - likelihood estimation (MLE)  The general form was given in Dempster, Laird, and Rubin (1977), although essence of the algorithm appeared previously in various forms. 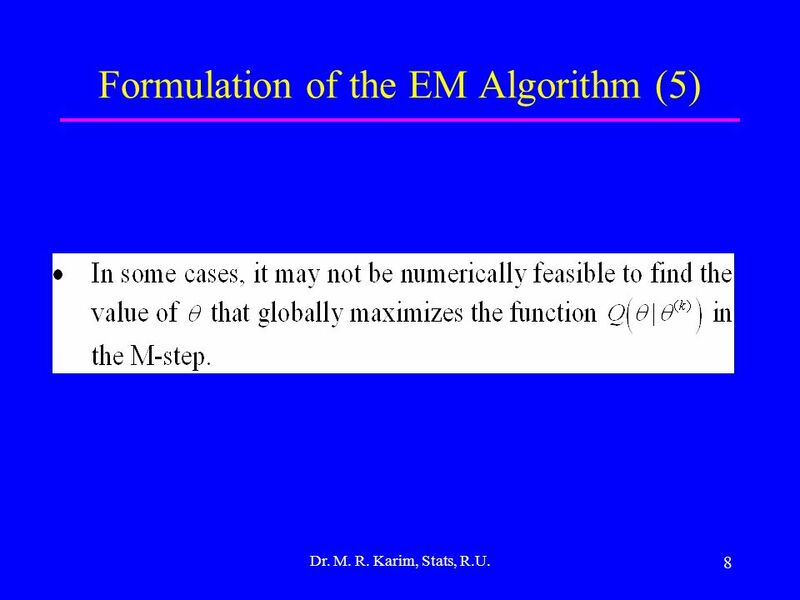 5 5 Formulation of the EM Algorithm (2) Dr. M. R. Karim, Stats, R.U. 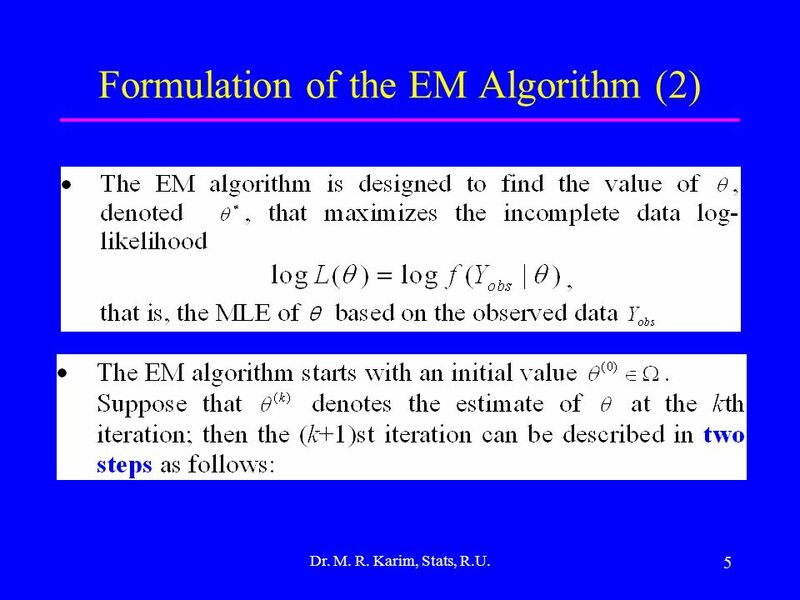 6 6 Formulation of the EM Algorithm (3) Dr. M. R. Karim, Stats, R.U. 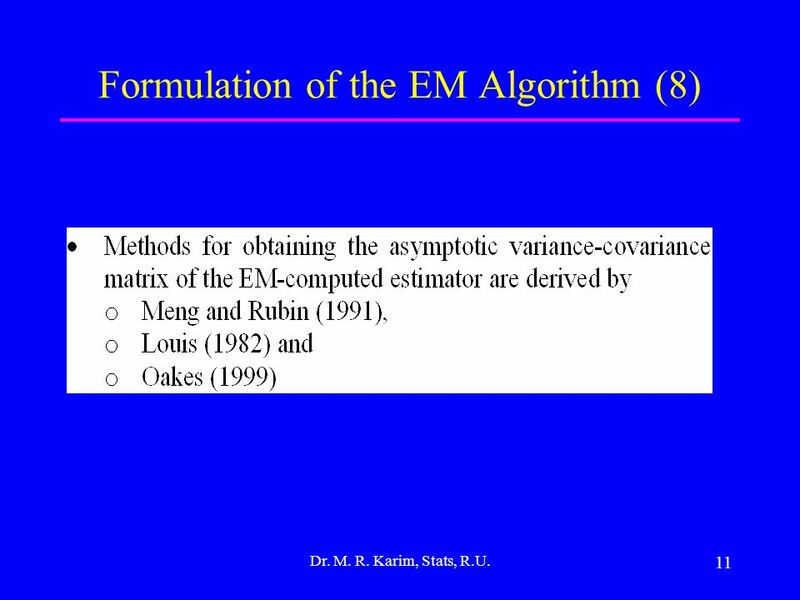 8 8 Formulation of the EM Algorithm (5) Dr. M. R. Karim, Stats, R.U. 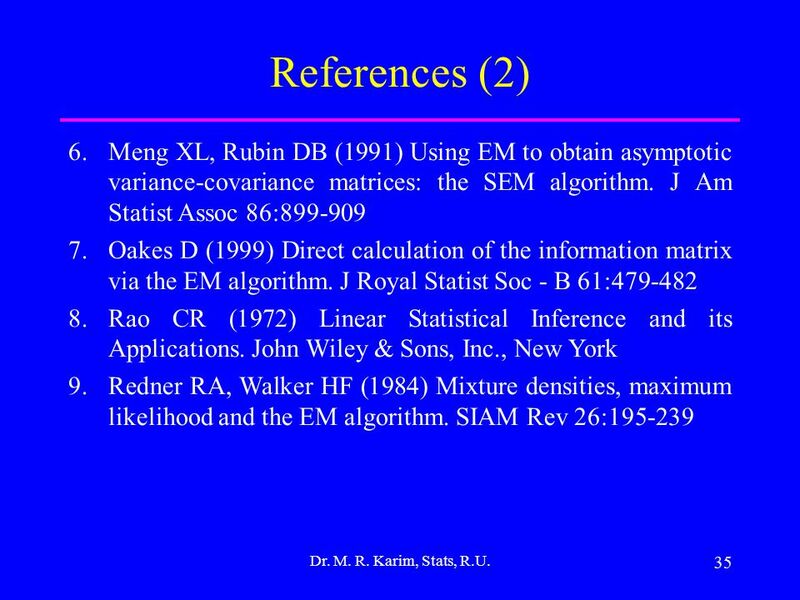 9 9 Formulation of the EM Algorithm (6) Dr. M. R. Karim, Stats, R.U. 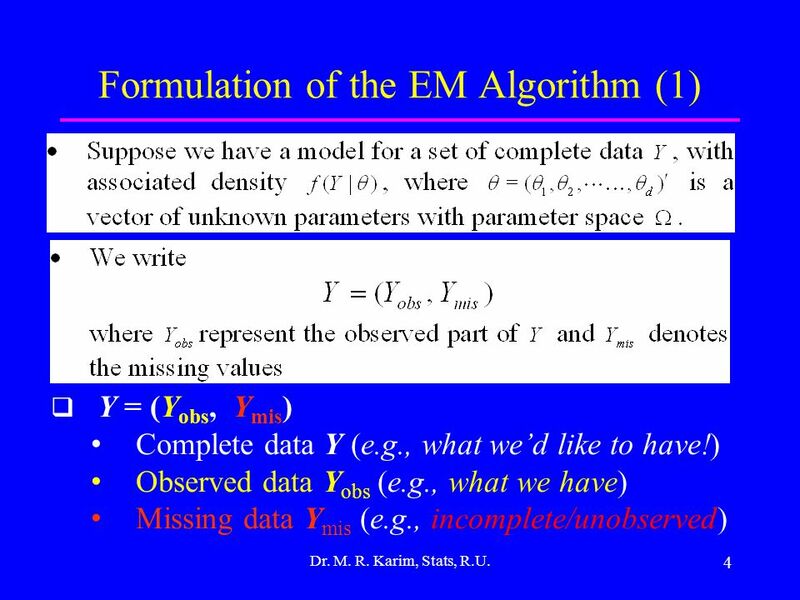 10 10 Formulation of the EM Algorithm (7) Dr. M. R. Karim, Stats, R.U. 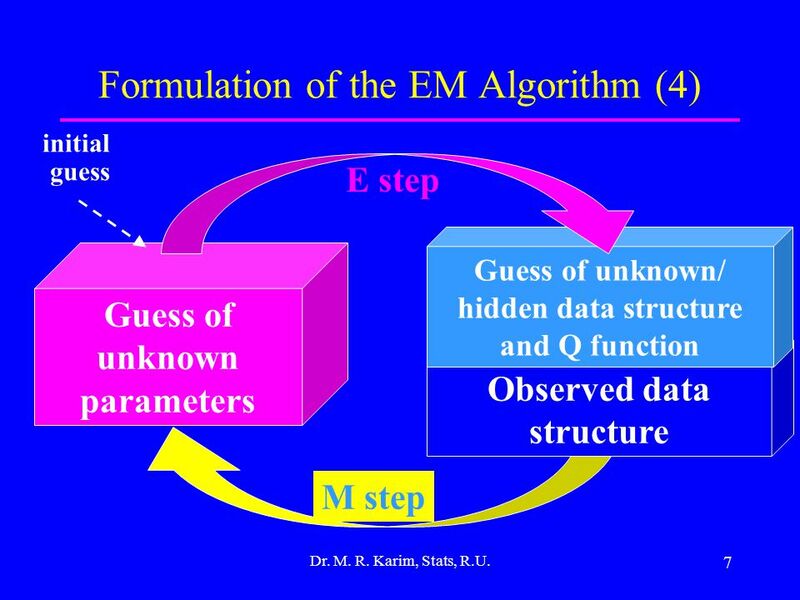 11 11 Formulation of the EM Algorithm (8) Dr. M. R. Karim, Stats, R.U. 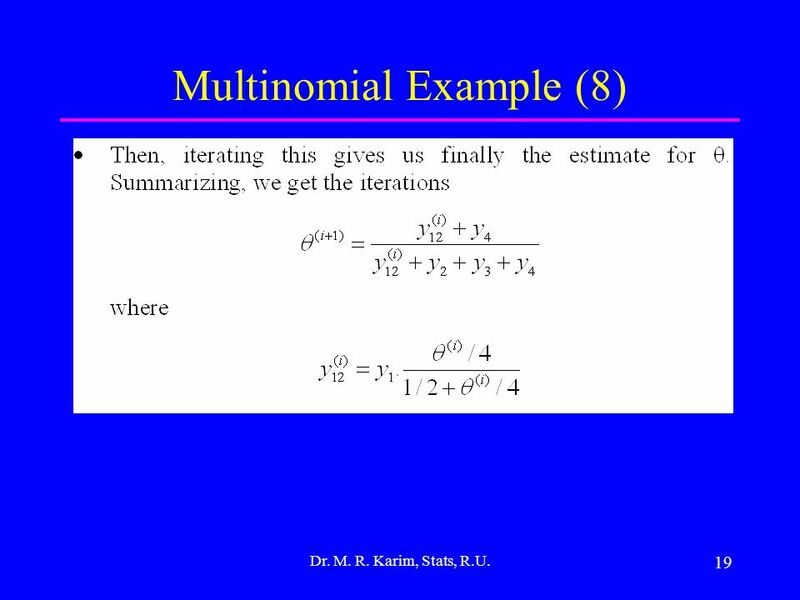 13 13 Multinomial Example (2) Dr. M. R. Karim, Stats, R.U. 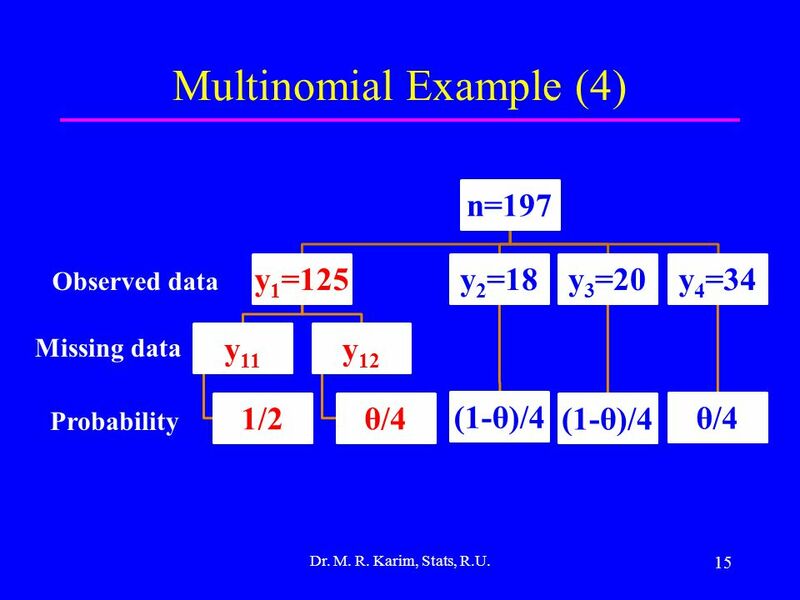 14 14 Multinomial Example (3) Dr. M. R. Karim, Stats, R.U. 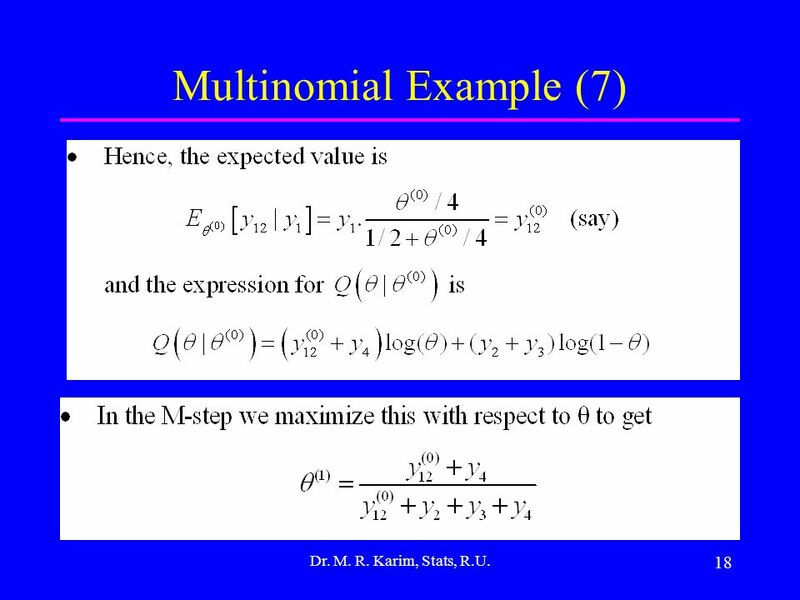 16 16 Multinomial Example (5) Dr. M. R. Karim, Stats, R.U. 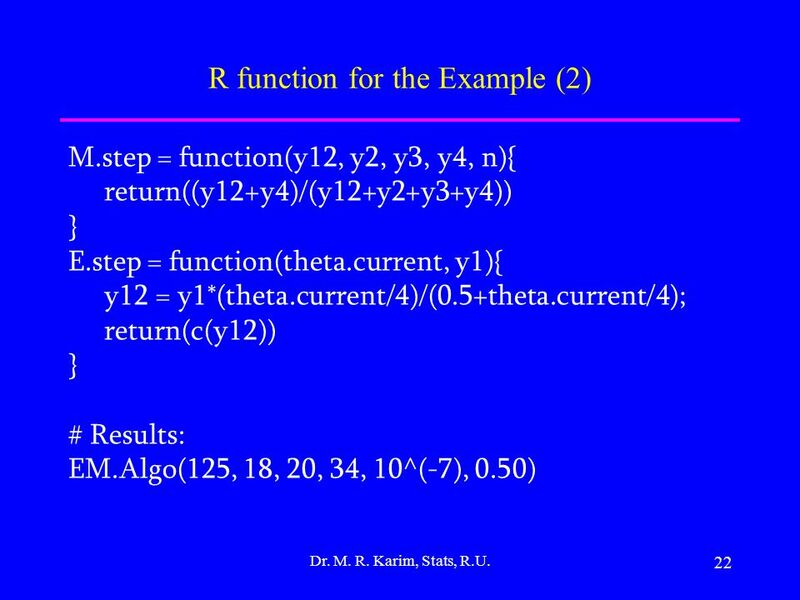 18 18 Multinomial Example (7) Dr. M. R. Karim, Stats, R.U. 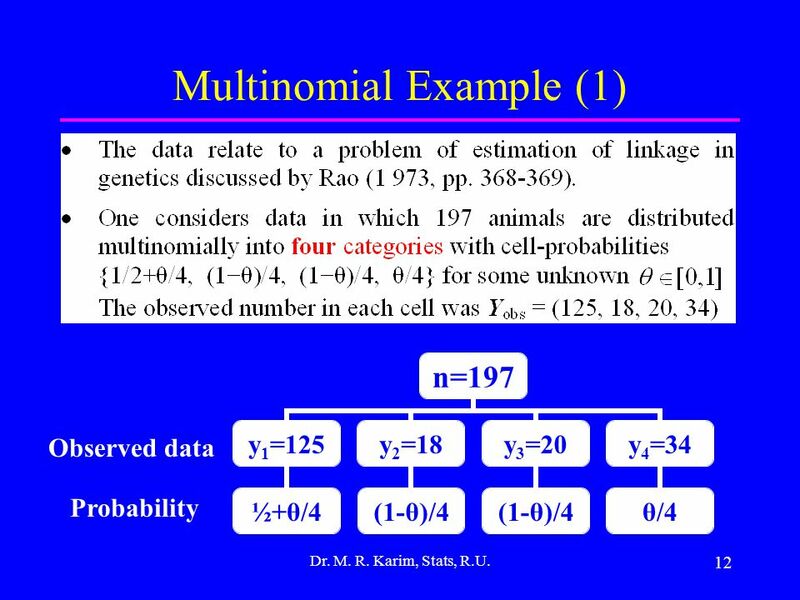 19 19 Multinomial Example (8) Dr. M. R. Karim, Stats, R.U. 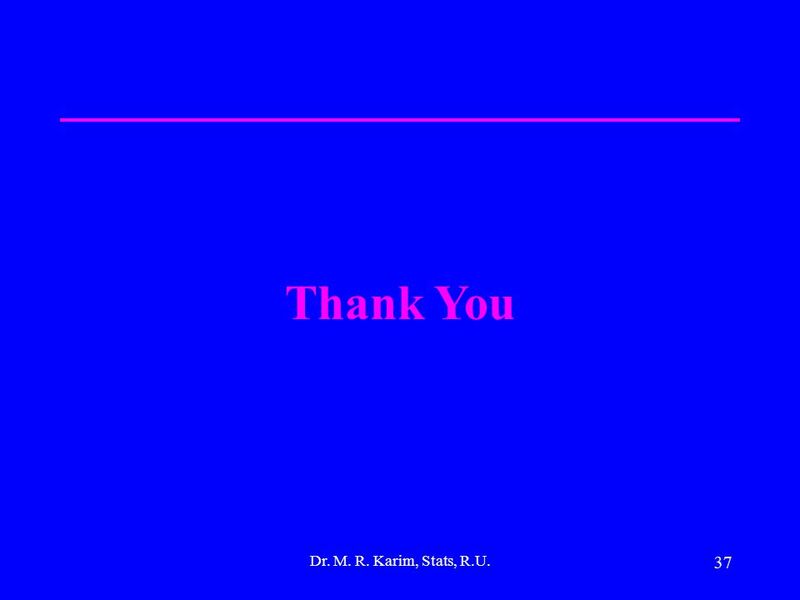 32 32 Dr. M. R. Karim, Stats, R.U. 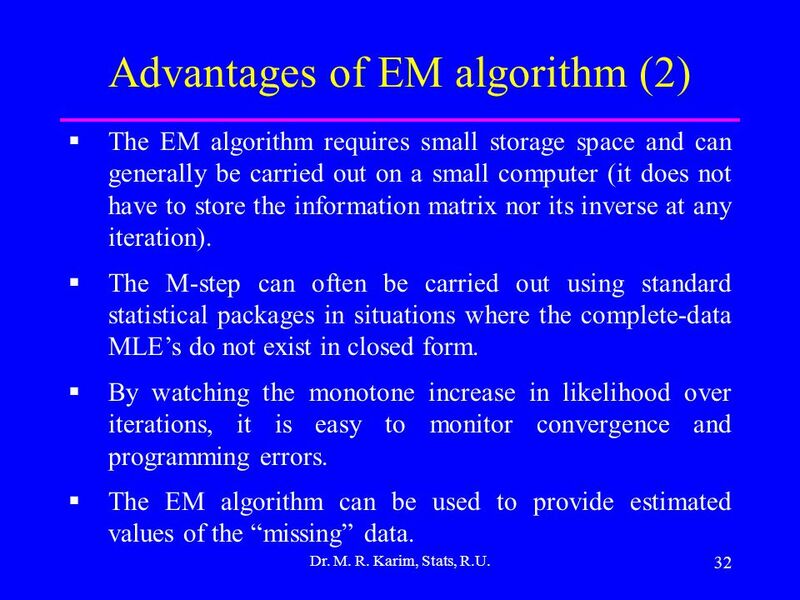 Advantages of EM algorithm (2)  The EM algorithm requires small storage space and can generally be carried out on a small computer (it does not have to store the information matrix nor its inverse at any iteration). 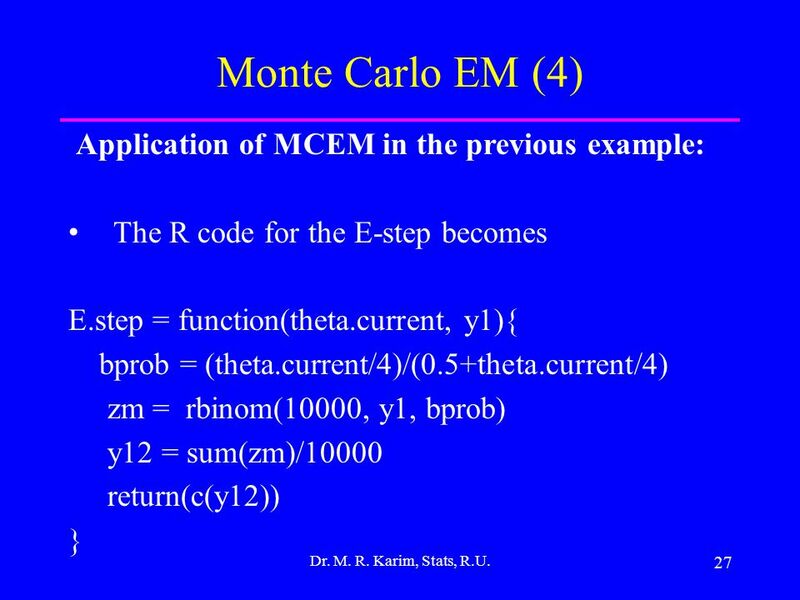  The M-step can often be carried out using standard statistical packages in situations where the complete-data MLE’s do not exist in closed form. 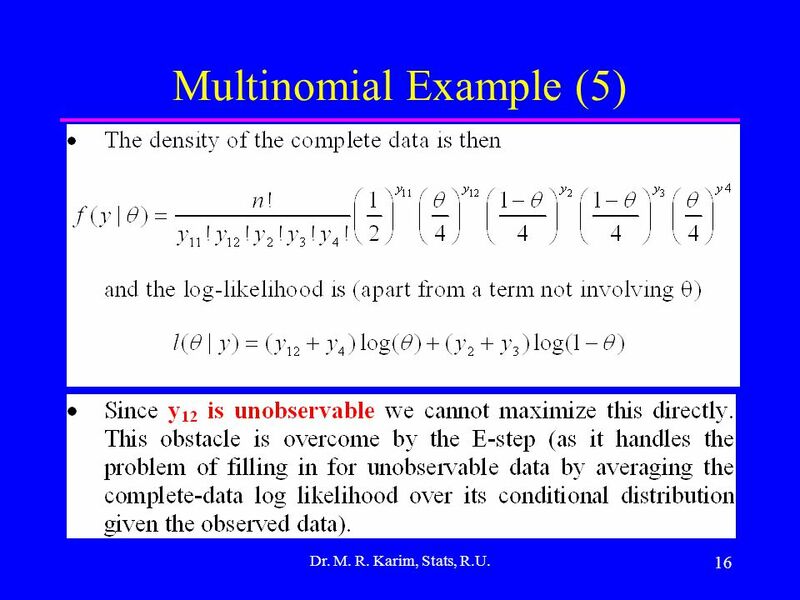  By watching the monotone increase in likelihood over iterations, it is easy to monitor convergence and programming errors. 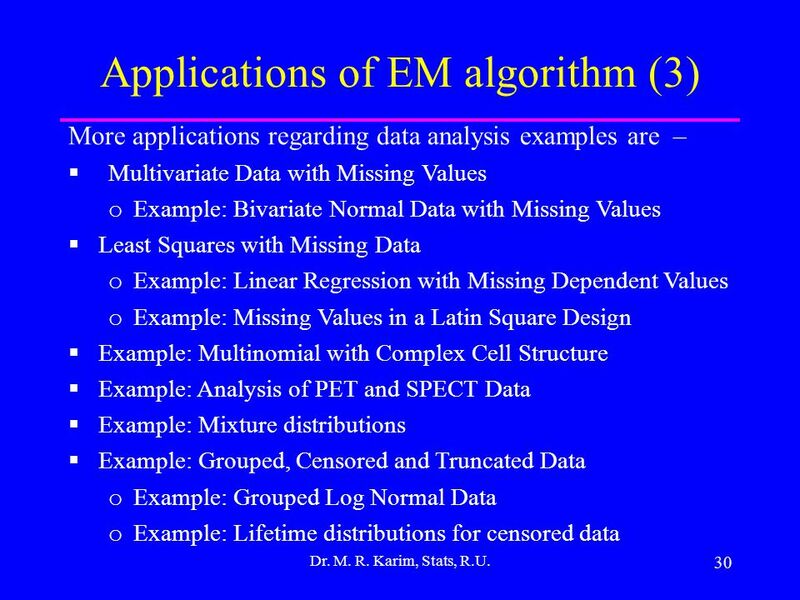  The EM algorithm can be used to provide estimated values of the “missing” data. 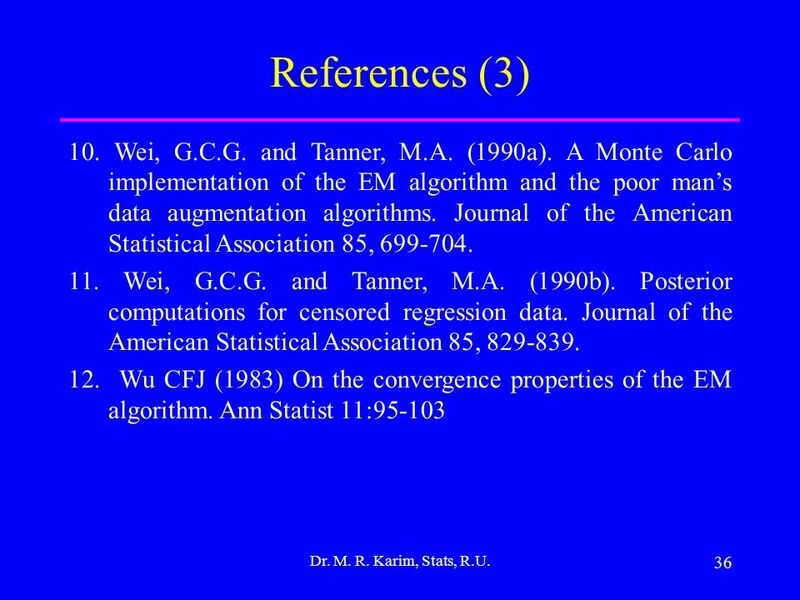 33 33 Dr. M. R. Karim, Stats, R.U. 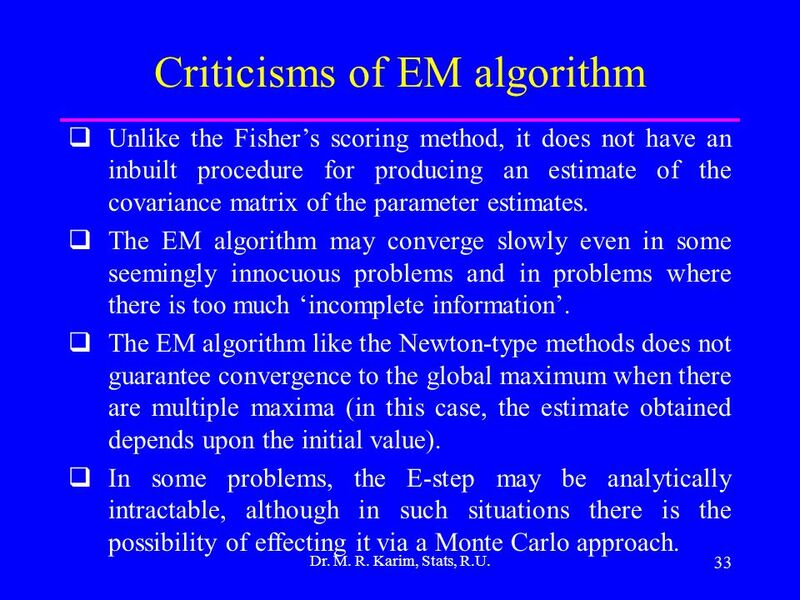 Criticisms of EM algorithm  Unlike the Fisher’s scoring method, it does not have an inbuilt procedure for producing an estimate of the covariance matrix of the parameter estimates. 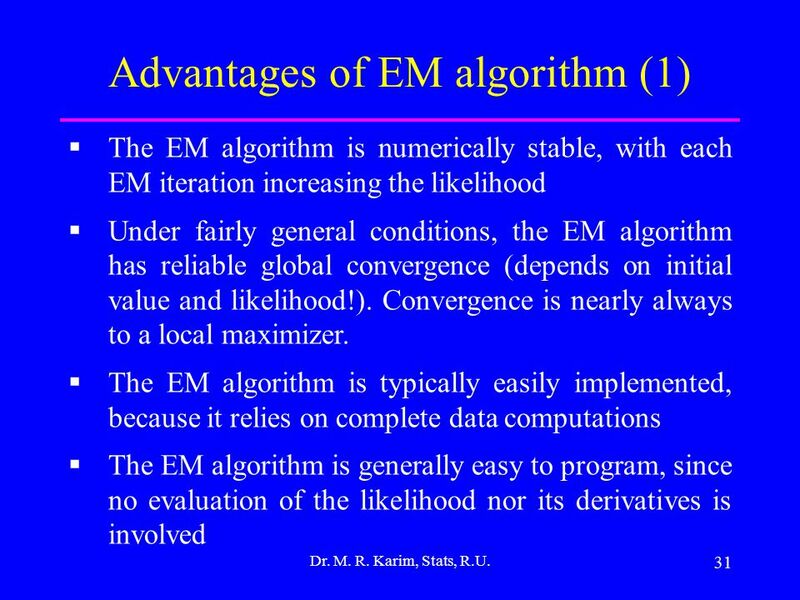  The EM algorithm may converge slowly even in some seemingly innocuous problems and in problems where there is too much ‘incomplete information’. 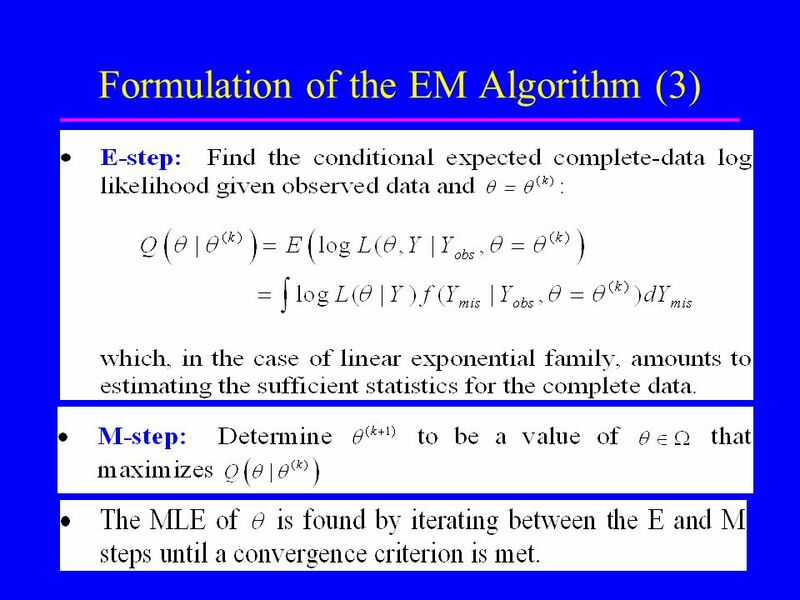  The EM algorithm like the Newton-type methods does not guarantee convergence to the global maximum when there are multiple maxima (in this case, the estimate obtained depends upon the initial value). 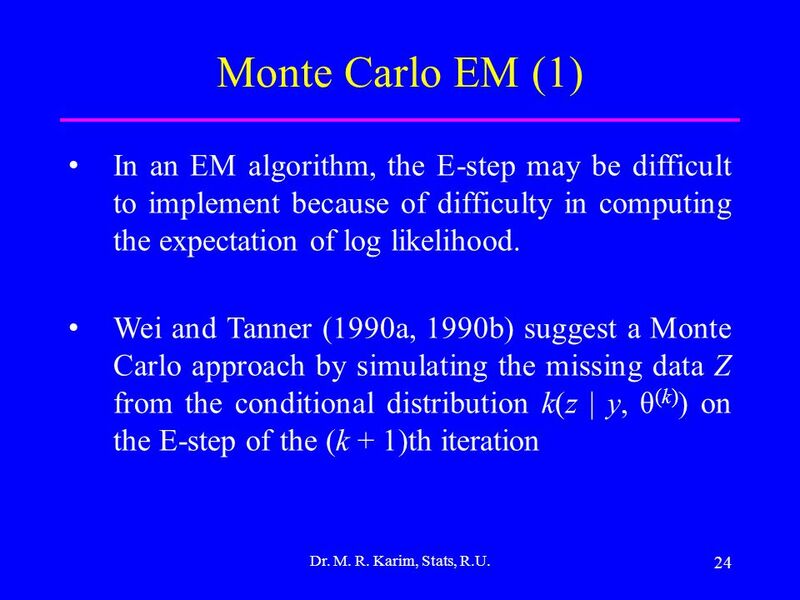  In some problems, the E-step may be analytically intractable, although in such situations there is the possibility of effecting it via a Monte Carlo approach. 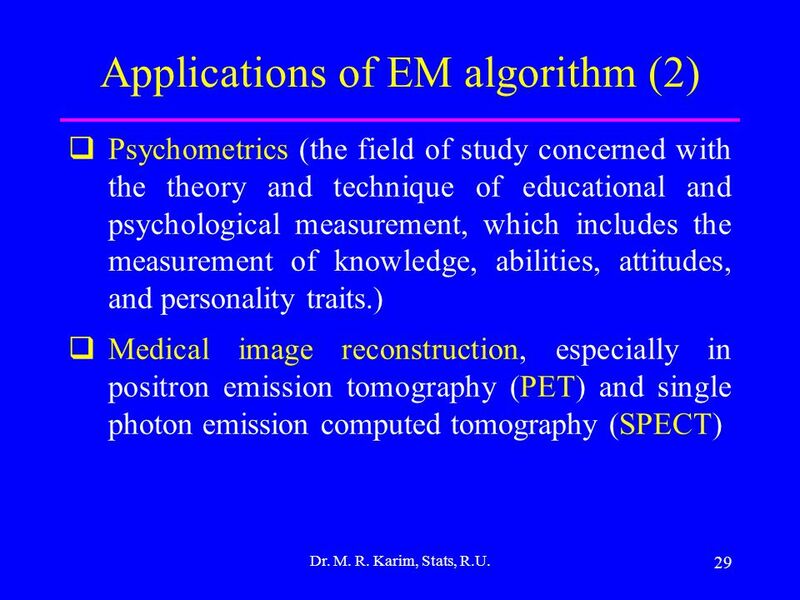 Download ppt "Expectation-Maximization (EM) Algorithm Md. 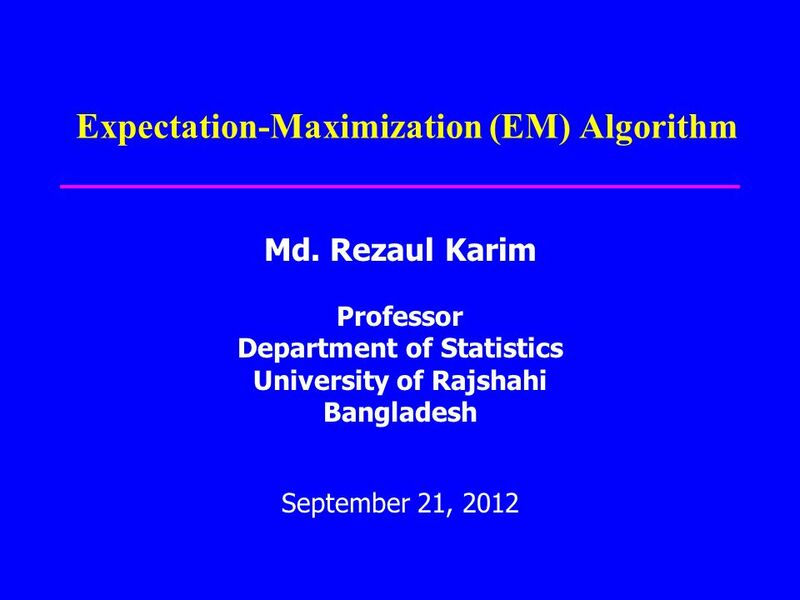 Rezaul Karim Professor Department of Statistics University of Rajshahi Bangladesh September 21, 2012." 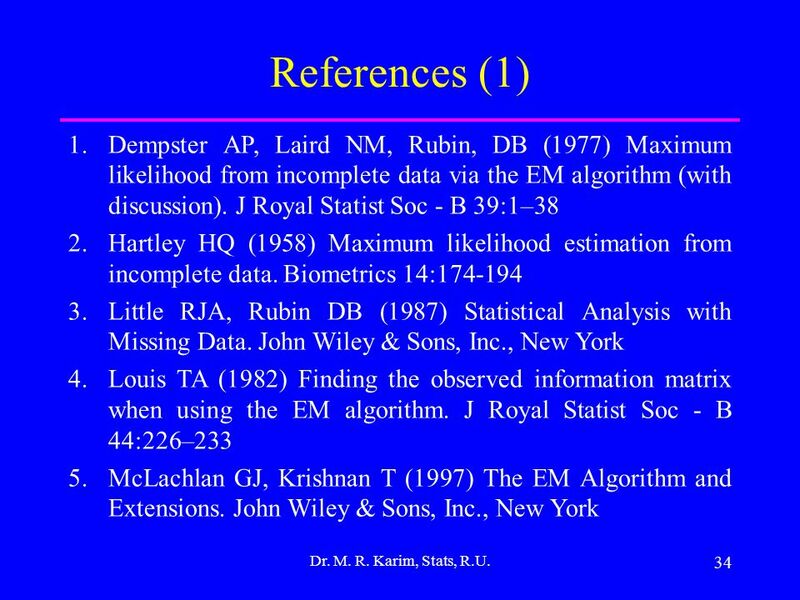 EMNLP, June 2001Ted Pedersen - EM Panel1 A Gentle Introduction to the EM Algorithm Ted Pedersen Department of Computer Science University of Minnesota. 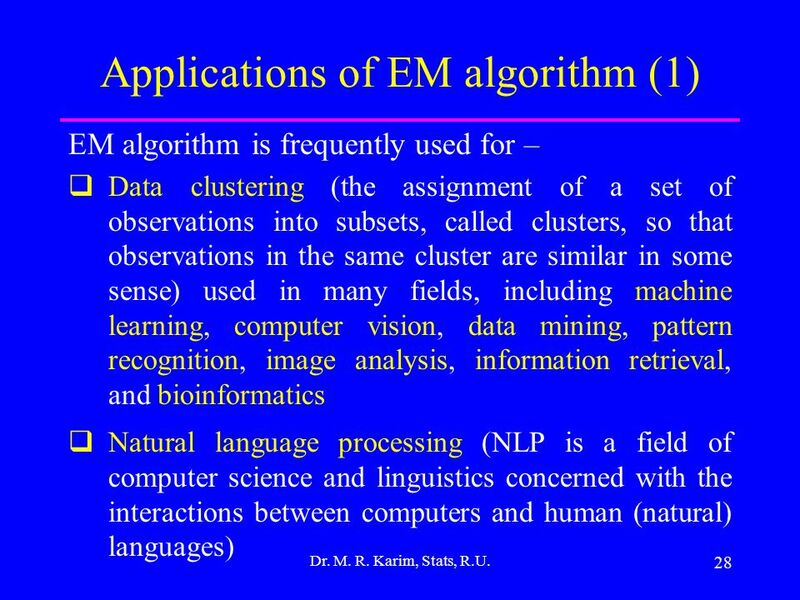 An Introduction to the EM Algorithm Naala Brewer and Kehinde Salau. 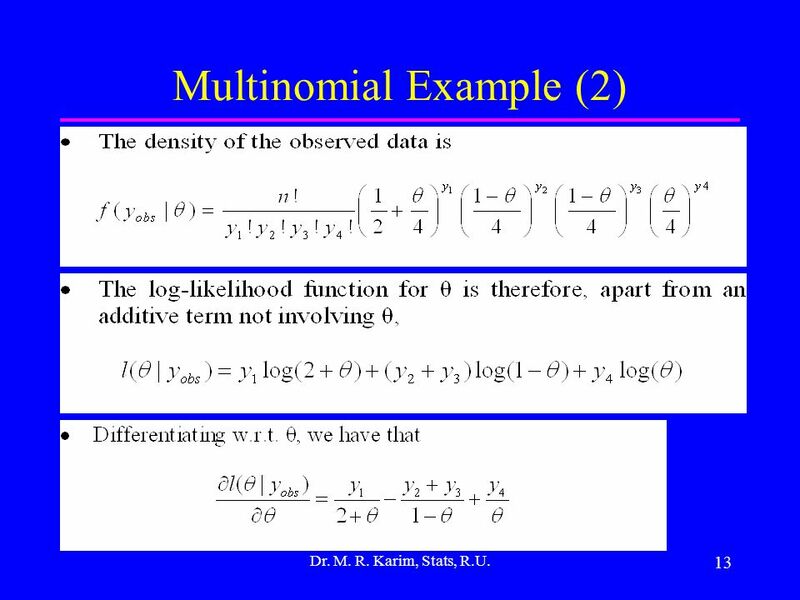 Chapter 7 Title and Outline 1 7 Sampling Distributions and Point Estimation of Parameters 7-1 Point Estimation 7-2 Sampling Distributions and the Central. 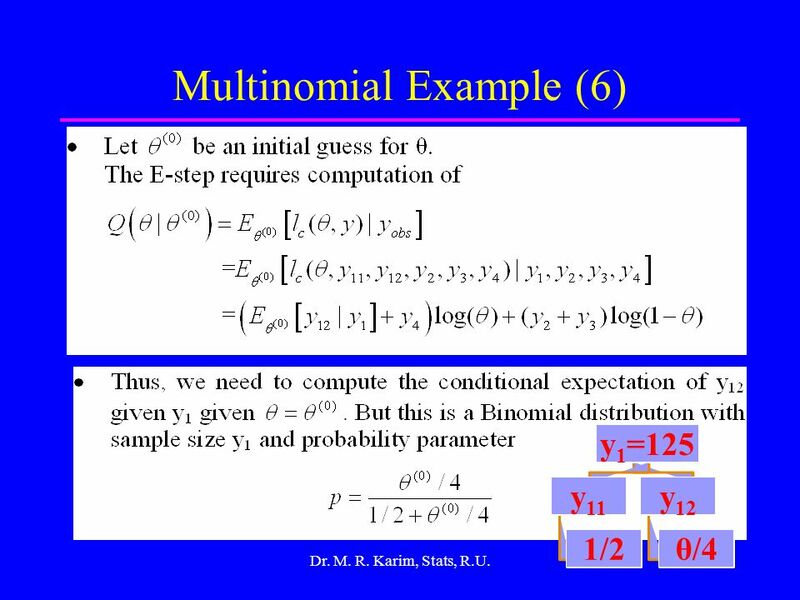 Maximum Likelihood And Expectation Maximization Lecture Notes for CMPUT 466/551 Nilanjan Ray. 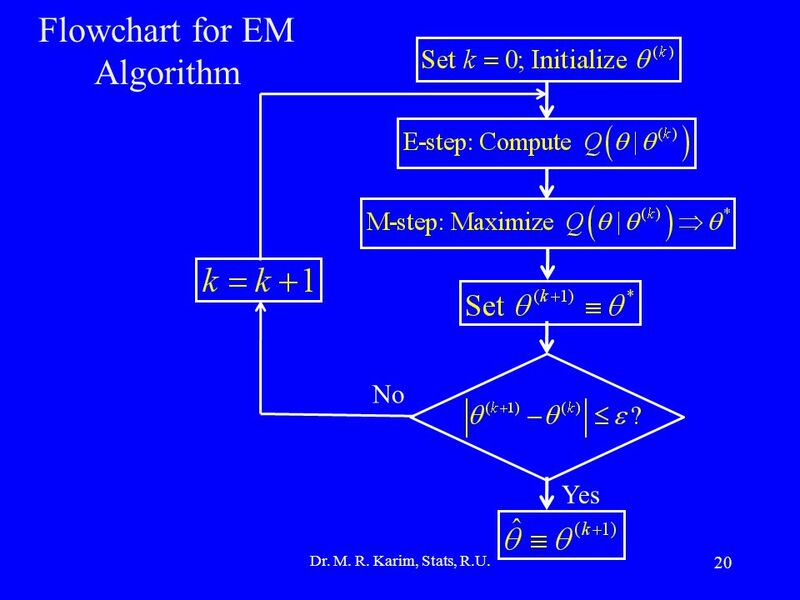 The EM algorithm LING 572 Fei Xia Week 10: 03/09/2010. 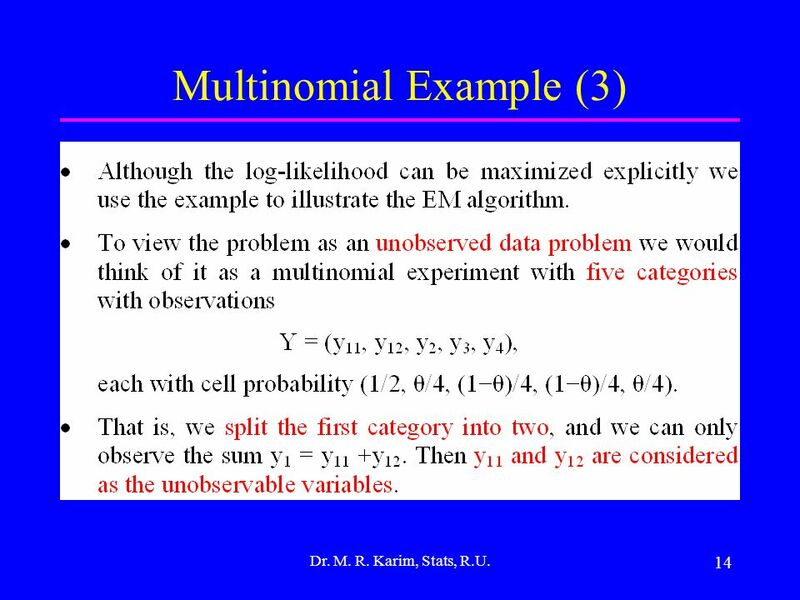 ECE 8443 – Pattern Recognition ECE 8527 – Introduction to Machine Learning and Pattern Recognition Objectives: Jensen’s Inequality (Special Case) EM Theorem. 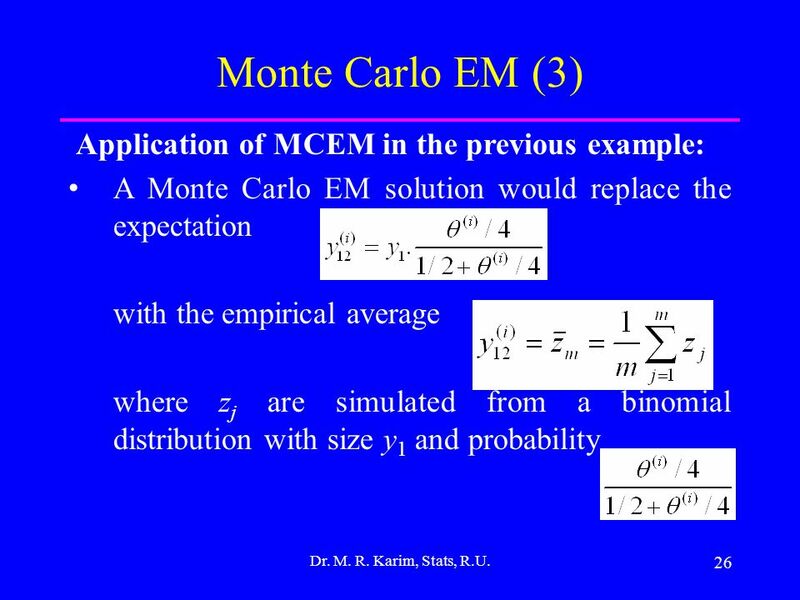 1 Expectation Maximization Algorithm José M. Bioucas-Dias Instituto Superior Técnico 2005. 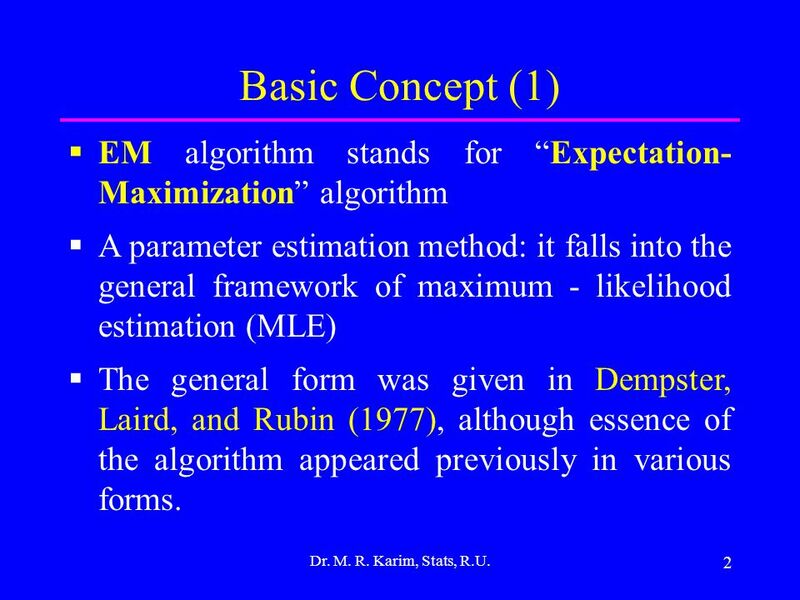 EE-148 Expectation Maximization Markus Weber 5/11/99. 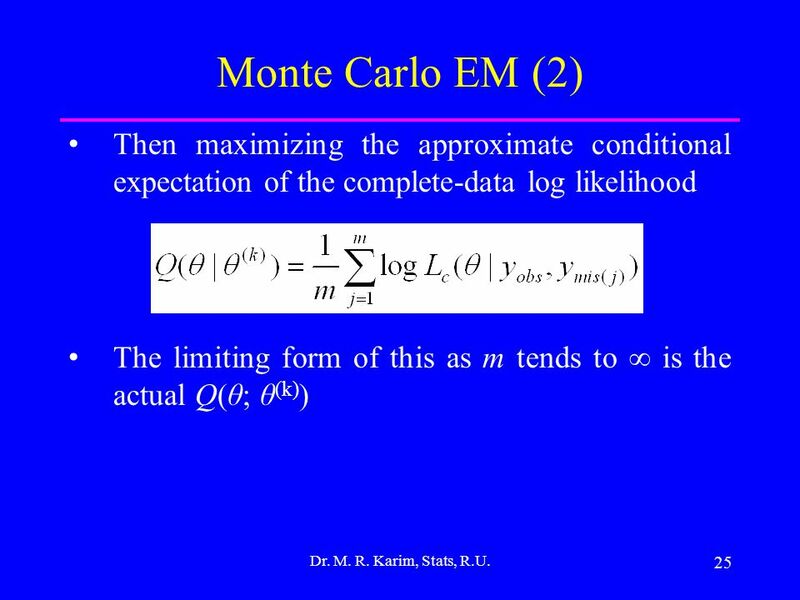 Maximum likelihood estimates What are they and why do we care? Relationship to AIC and other model selection criteria. Resampling techniques Why resampling? Jacknife Cross-validation Bootstrap Examples of application of bootstrap. 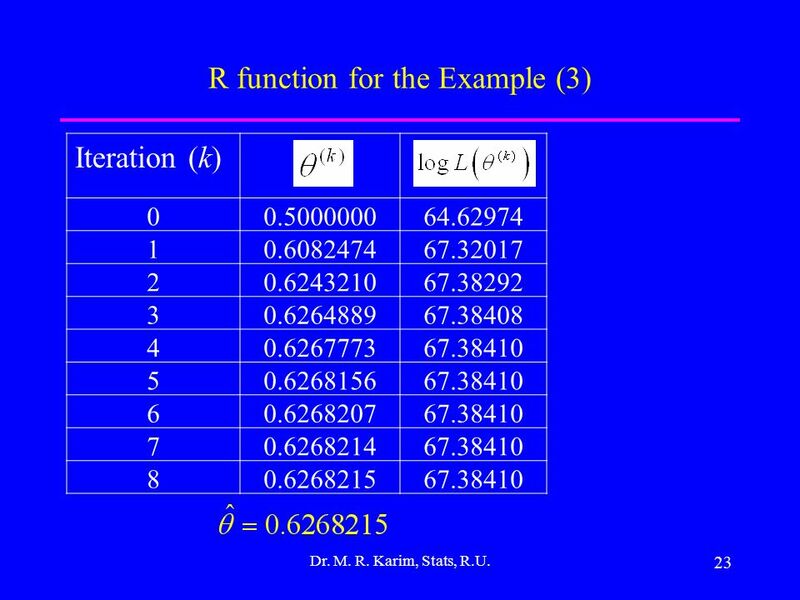 First introduced in 1977 Lots of mathematical derivation Problem : given a set of data (data is incomplete or having missing values). Goal : assume the. 0 Pattern Classification All materials in these slides were taken from Pattern Classification (2nd ed) by R. O. Duda, P. E. Hart and D. G. Stork, John. 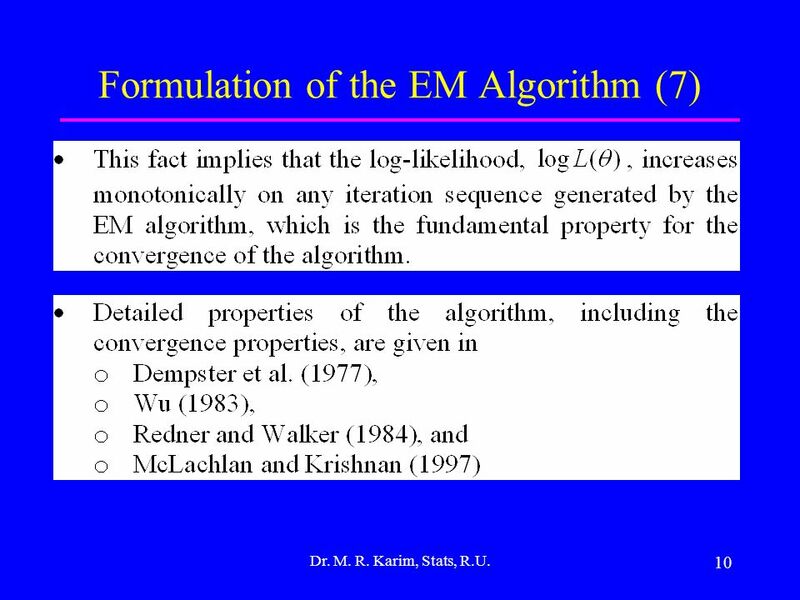 The EM algorithm (Part 1) LING 572 Fei Xia 02/23/06.